Autumn is the best time of year to get into reading. The nights are drawing in, everyone’s short on cash after a sociable summer, and we’re coaxed indoors from the chilly weather. You get the woolly socks and heating on, and the scene is set for curling up on the sofa, wrapped in a blanket and armed with an oversized mug of tea. Inspired by the back-to-school feeling that no one really grows out of, we’re all after a brand new book and maybe some freshly sharpened pencils... It's time to nestle with a novel and escape the world outside. Here are some of the best new page-turners for the autumn months ahead. If you were wanting to see something new and different from André Aciman following the success of his last book Call Me By Your Name, you might be disappointed to find that Enigma Variations is not much of a break in style. But is that really any bad thing? It traces stories of all-consuming love with the same kind of emotional intensity as Call Me By Your Name, and with Aciman’s familiar style of lyrical, unabashedly candid writing. The story opens with the protagonist Paul returning to the island on which he first fell in love, with cabinet maker Giovanni. The narrative shifts and moves in time, tracing Paul’s relationships with men and women over the years. It’s a vibrant, colourful read. One to read when… you want to be enveloped in a narrative during an autumnal weekend in the Cotswolds. It’s no real surprise that Jo Brand is a good writer, and this book is full of engaging, witty prose, just like her comedy. 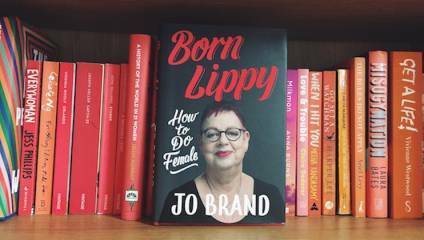 In this new autobiography she celebrates being the ultimate ‘grumpy woman’, and explores what it means to be a female today. Alongside her personal narrative, Brand talks about broader social issues in an informed and insightful way. Quite a few books have been written by comedians about the female body and the status of womanhood, not least of which Sara Pascoe’s Animal, and Brand’s contribution is a worthy addition. That said, I still prefer Pascoe’s. Whoops. One to read when… you want to retreat from the world and be all grumpy and fabulous, unabashedly armed with a pumpkin spiced latte. This was a recommendation from writer and journalist Dolly Alderton on The High-Low podcast, so I obviously jumped to attention and sourced myself a copy. It is written by Jill Soloway, who wrote the Amazon TV series Transparent, based on her experience of her father coming out as transgender. The show was an exploration of love and relationships and the rigid framework of gender, and went on to have international success. While working on the show, Soloway began to question her own gender identity, consequently coming out as queer and non-binary. This book traces this complicated, somewhat thorny part of her life. Its easy-to-read humorous prose makes it a great entry point for an often difficult subject to access. Soloway’s analysis of the construction of gender is something everyone should read. One to read when… you want/need to expand your understanding of gender identity. Ali Smith is fast becoming one of the biggest writers of our generation, with a number of major accolades and awards to her name. Her prose is clean and colourful, and Winter is a fantastically atmospheric read with insightful and fascinating interior monologues. Winter is set at Christmastime in Cornwall. We are first introduced to the mother, Sophie, whose world is one of hallucinations and a general state of disenchantment. Her son, Art, comes home for Christmas with a young immigrant girl named Lux, who he has hired to impersonate his recent ex-girlfriend. They are joined by Iris, Art’s aunt, a passionate activist. They all have to spend Christmas together. It’s a story of the clash between relatives and strangers, and a contemplation of the role of Christmas as a marker of time passing, and a time in which families come together under different circumstances every year. As with Ali Smith’s last book Autumn, the way she writes about the influence of seasonal shifts on the life of her characters is utterly enveloping and very unusual. One to read when… you’re curled up in front of the fire wearing your finest cashmere socks. Scarlett Curtis will be familiar to you for a number of reasons: firstly, she is the daughter of screenwriting and script editing duo Richard Curtis and Emma Freud, and secondly, she is the co-founder of The Pink Protest, the community of activists born out of Instagram, who support the free period movement. This is her first book: a collection of new writing from women from the worlds of activism, Hollywood and the arts. Authors include comedian Lolly Adefope, model and activist Adwoa Aboah, writer Dolly Alderton, comedian and host of The Guilty Feminist podcast Deborah Frances-White, actor Keira Knightley, activist and campaigner Nimco Ali and the CEO of Bumble Whitney Wolfe Herd. The contributors describe their lived experience with feminism and being part of a sisterhood. It’s by no means a groundbreaking collection – there are certainly better pieces of writing on these issues – but the varied viewpoints offer different personal narratives, amplifying these individual voices, which is something to be valued in this field where certain voices and styles of writing can dominate. One to read when… you’re trying to find a way into feminist reading as part of your ‘back to school’ education.